Happy Independence Day! It’s time to toss together a patriotic kids platter that’ll dazzle your bbq buddies: Fruit Kebab Flag! Let me start off by saying that I love hot, muggy July more than most. I share a birthday with good old USA and we celebrate together with fireworks each year! I know it’s one of those months for everyone else though. Kids are out of school, home life is mayhem, and we’re all just hoping to catch a cool breeze. 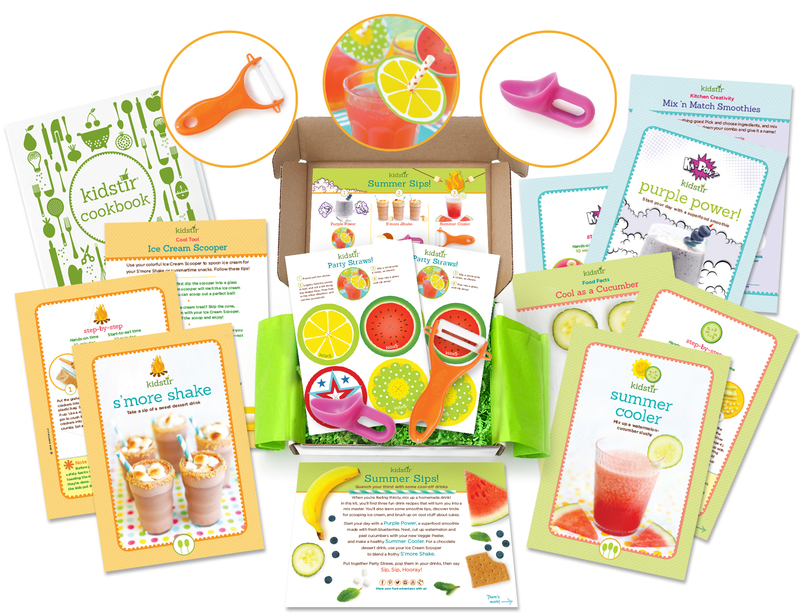 I promise our July Summer Sips kit is going to take the heat off – it is packed with fun, tasty, healthy drinks ideas, along with some super yummy treats too. And in our quintessentially Kidstir style of educational fun, there is also lots of learning – math, science, reading, nutrition, and more! 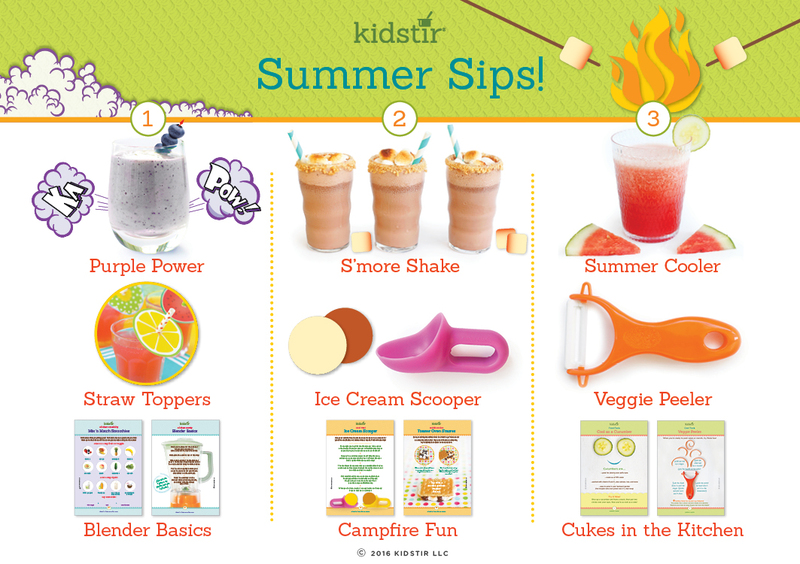 Our Summer Sips Kit is a surefire winner this summer! When you get the kit, start off by checking out Summer Kitchen Smarts with great inspiration on how you can work learning into everyday kitchen fun. You’ll want to dive into science fun with our Orange Float, a science experiment kids can eat! And seriously, don’t hold back – check out our Ice Cream in a Bag recipe and learn about salt, freezing temperatures and that you can whip up something miraculous (ice cream!) from a few simple ingredients. No machines necessary! Making Strawberry Sun Tea is also a fascinating way for kids to learn about solar heat. It’s educational, I promise! You should also read our Blender Basics foodie card in the Purple Power recipe. This one really is a great primer/reminder for all ages of how to use a blender safely and effectively at home. And before you start stirring up all these great drinks, have the kids check out Rethink Your Drink. You will all learn a lot and reinforce why it’s important to make fresh drinks as much as fresh food. Now it’s time to tear into your kit and start stirring up fun with Kidstir! Purple Power. Start your day with a superfood smoothie! What I love is that this recipe is a classic with a twist. Instead of yogurt, we’re using Greek yogurt, instead of processed sugar, there’s a ripe banana. Blueberries add tons of antioxidants and a gorgeous hue. If you’re ready to amp the nutrition up even further, toss in Secret Ingredient chia seeds for a turbo boost! Along with this recipe, we have a Kitchen Creativity Mix n Match Smoothies primer that is a lifelong keeper in my mind. Basically we’re teaching the fundamentals of smoothie making, and then encouraging kids to get creative with those simple proportions in mind. There are also lots of suggestions that stretch beyond the typical, including spinach, peach, cucumber, avocado, coconut water/milk, almond milk. Once your juice bar-istas (get it?) are really in the swing of things, whip up this Green Dragon drink together. Eating their greens will never be the same! S’More Shake. I am looking at this recipe and salivating. S’mores, in a drink? Have I gone to heaven? Besides the out of this world taste of this little sweet treat, they’ll also pick up some easy Kitchen Tricks that add flair to presentation, like how to make Graham-Rimmed Glasses. And talk about a hat trick. In our foodie page we’re going to unveil the mind blowing Quick Recipe for Toaster Oven S’Mores. Whaaaaa? Yes! You can have a near-perfect s’more without fire and dirt (though those have their own pleasures, no doubt!). Once your sweet tooth is rocking’, try a fruitier option with our Mango Creamsicles. Mmmm…! Summer Cooler. Aaaah, this drink recipe is all about chilling’. Relaxing by the pool, at a bbq, or on a picnic, with this drink plus some Nice Ice you’ll relax to the max. This Watermelon- Cucumber Slushy is one of those flavor mixes that is totally kid friendly and equally appealing to grown up palates. And I love that we’re finding another way to healthfully incorporate veggies into our natural juices. Along this same line, we have several other light and refreshing drinks for your juice bar-istas to stir up. Check out Magic Melonade, Lemon Fizz, Grape Fizz, and Sip Sip Hooray for more fun! And once you’ve really got your fizzes and melonades down pat, how about a modern reinvention of the lemonade stand? Kids can use our Business Record here to keep track of their riches! This month’s kid-friendly cooking tools and activities truly make the kit. Here are the goodies this month! Straw Toppers. We know there will be family dinners, neighborhood bbq’s, summer pool parties…and with these adorable, colorful Straw Toppers you’ll be able to add some pizazz to all those delicious drinks you’ll be serving up. After you use up the ones in your kit, print more out here. Have fun and use these as a starting off point to think about how to present all your creations with style! Ice Cream Scoop This is such a cute little tool. What I love about it is that it’s the perfect size for kids and grown-ups alike. You know how you want just the right amount of ice cream, more than a spoon full but not as much as a giant scoop full? This is it, this is the Goldilocks of ice cream scoopers. We teach you more about how to use this in our Cool Tool foodie page. Enjoy! Veggie Peeler When we developed Kidstir we knew we wanted to include the all important vegetable peeler in a kit, and Summer Sips was the perfect place for it. Veggies in drinks provide the perfect balance and show that natural flavors can be the most delicious of all. Your kids will learn Chef’s Secret How to Seed a Cuke, Food Facts Cool as a Cucumber, and how to properly use this Cool Tool Veggie Peeler. We searched far and wide for the peeler that would work best for little ones learning to use cutting tools. The ergonomic, wide Y shape is easier for little hands to hold stably, and the ceramic blade is smooth and sharp, which actually increases the safety factor. Do be sure to demonstrate safe use of this tool to your kids, and stay around while they master it. You’ll be impressed at how soon they’ll be asking to peel the next veggie out of the basket! Are you ready to stir up some delicious Summer Sips? You are going to have so much fun making these tasty drinks and serving them up to your family and friends. In addition to all the goodies in this kit, remember to check out all the great drink ideas on our DIY page. You are going to have a blast this month! Happy July! Please do share all your fun experiences, and tips and tricks, with us on Facebook, Instagram, Pinterest, and Twitter. We love letters with photos too, which you can send to email hello@kidstir.com.